We have some excellent ideas for a Winnie the Pooh nursery theme and Pooh baby nursery decorating ideas including easy, DIY nursery painting techniques shared by parents that painted a nursery mural of a clear blue sky and some free floating fluffy clouds on the ceiling of their baby's room. The same talented moms and dads that stopped by to tell us about their wall and ceiling murals also tipped us off to some crafts projects that may save money on decorations and where to go to find a set of classic Winnie the Pooh baby bedding for prices less than we ever imagined possible. After you have made your rounds of the baby stores and boutiques and found a few items that will be included in the décor you will have what you need to lay out your nursery's color scheme which will be determined by these inspiration pieces. A classic Pooh nursery can be very elegant and understated or as playful as can be depending on color, bedding fabric and wall decor. Usually the first step in your Winnie the Pooh nursery theme would be to find the perfect set of Pooh crib bedding and then choose your wall paint color and room decorations. SEE MORE ITEMS HERE including crib sets that can serve as a guide in achieving a balanced color pallet in your Pooh Bear nursery. A Winnie the Pooh Nursery Theme is one of the most popular and beloved nursery themes for boys and girls, too, now that there are crib sets available in pink. A classic, gender neutral nursery is a very attractive possibility, as well. Artists might prefer to paint their own artwork on the nursery walls. The beautifully illustrated pictures in the Pooh storybooks are filled with inspiration for a Winnie the Pooh nursery mural. Those of us with little or no artistic talent can make use of inexpensive and readily available vinyl wall decals to personalize the walls and nursery furniture. To successfully create your Winnie the Pooh nursery decor we will focus on the pages of the classic tale for decorating ideas. The pictures will be inspirational in choosing the right colors, decorations and backgrounds for Winnie the Pooh nursery themes for boys, girls or if you prefer, a gender neutral theme. Please have your storybook open as we guide you through the quick and easy steps towards achieving a classic Pooh decor. 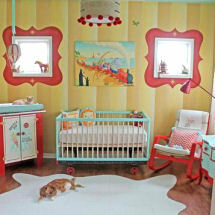 You will want to refer to the colorful pictures in the book as you build your list of nursery ideas. Choose your favorite characters and colors as we go. 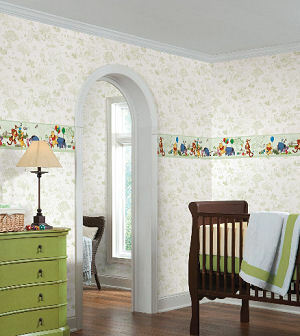 For your Baby Pooh nursery theme window treatments there are some really nice honey bee theme sheers available. I would avoid repeating the same Winnie the Pooh theme fabric that you use for your baby bedding too many times in your Winnie the Pooh decor or the room will appear too busy. A framed Baby Pooh picture, art print or vintage poster of Winnie the Pooh Bear and Friends would look great in your Winnie the Pooh Nursery theme. Add some pictures of friends, Tigger, Eeyore and Piglet to make a picture gallery if your wall space will allow. A personal photo in a cute Winnie the Pooh motif frame. Stencil a favorite classic quote from the Winnie the Pooh story on the nursery wall. Apply Winnie the Pooh stickers on a child's game table. 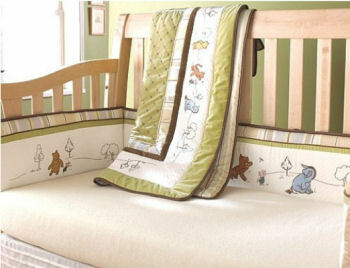 Please visit Unique Baby Gear Ideas often to see more classic Pooh nursery theme decorating ideas. I hope that you will also consider sharing pictures of your baby's classic Winnie the Pooh nursery when you are finished. Our visitors would love to see your Winnie the Pooh baby nursery ideas!